What Type Of Exercise Is Recommended After A Physiotherapy Treatment? | Dynamic Physiotherapy & Sports Injury Clinic Inc.
What Type Of Exercise Is Recommended After A Physiotherapy Treatment? Exercise and physiotherapy are effective tools for overcoming injury and improving physical performance. Implementing an exercise program after a physiotherapy treatment must be done correctly in order to achieve results. Your physical therapist can help you determine the best way to incorporate exercise into your treatment program. But what type of exercise is recommended after a physiotherapy treatment? The following will provide you with the information you need to begin using exercise to restore strength, improve joint range of motion, and optimize your recovery. Exercise must be applied according to the needs of each physiotherapy patient. A skilled physiotherapist performs a comprehensive assessment to identify and prioritize issues that need to be addressed. More importantly, this allows them to prescribe the right exercises that will support the healing process. Factors that influence the type of exercises that are ideal for your treatment plan include age, health history, current injury or condition, and exercise experience. The right exercise intensity is important when following a physiotherapy treatment. Intensity levels that are too high can lead to pain and repeated injury. If pain is present during exercise, muscles can become inhibited and fail to work properly. Muscle imbalances and weakness require the use of specific exercises to help restore the ability to activate important stabilizer muscles that support the joints. Overlooking these muscles can prevent you from recovering from injury and may increase the risk of future problems. Exercises that address the stabilizers around the affected joint are essential in the early stages of conditioning. These require specific movements and low levels of intensity. Higher resistance causes the larger muscles to take over and robs these important stabilizers of the stimulus needed to restore function. Most stabilization exercises can be performed without the need for equipment and are ideal for home use. Your physiotherapist can help you progress your exercise program in a way that maximizes results and protects you from injury. The right exercise dose is critical to your recovery. Exceeding the recommended intensity, duration, or frequency of exercise can be counterproductive. Applying a progressive approach allows muscles to adapt to the stimulus over time. As you improve your ability to move and engage muscles, you can begin to increase the intensity and complexity of your exercises. Skipping your exercises, doing them incorrectly, or not using enough resistance can also prevent you from achieving results with your physiotherapy program. 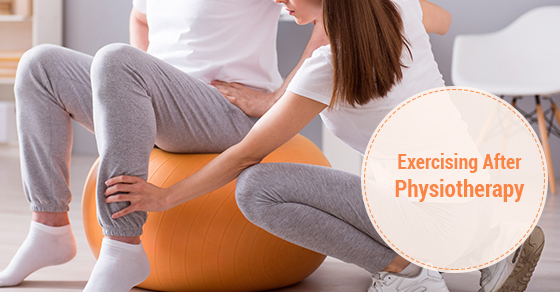 Exercise is beneficial after a physiotherapy treatment. But it must be applied correctly and according to your unique needs. Your physiotherapist can prescribe the right exercise program to help you recover from injury and restore lasting health.